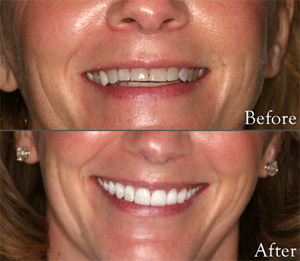 Porcelain dental veneers are a beautiful way to correct stained, chipped, or crooked teeth. By placing a customized porcelain shell over the surface of the tooth, dentists can provide patients with bright, aligned, and natural looking smiles. Dental flaws that may have been a source of embarrassment or discomfort for years can be corrected with porcelain veneers in as little as one or two appointments. Cosmetic bonding procedure utilizes a composite resin (which is also used for cosmetic dentistry veneers) and is used for a variety of structural as well as cosmetic purposes. One can draw a parallel between dental bonding materials and a sculptor’s clay. By using dental composite resin bonding your dentist can restore chipped or broken teeth, fill in gaps and reshape or recolor your smile. cosmetic dentistry veneersCosmetic bonding is a composite resin filling placed in the back teeth as well as the front teeth. Composites are the solution for restoring decayed teeth, making cosmetic improvements and even changing the color of your teeth or the reshaping of teeth. Bonding will lighten any stains you may have, close up minor gaps and can be used to correct crooked teeth. Basically, bonding will cover any natural flaws applying a thin coating of a plastic material on the front surface of your teeth. After this, your cosmetic dentist will apply a bonding material and sculpt, color and shape it to provide a pleasing result. A high-intensity light then hardens the plastic, and the surface is finely polished. A very mild etching solution is applied to your teeth to create very small crevices in the tooth’s enamel structure. These small crevices provide a slightly rough surface permitting a durable resin to bond materials to your teeth. The resin is then placed on your tooth and high-intensity light cures the resins onto your tooth’s surface — with each individual layer of resin hardening in just minutes. When the last coat has been applied to your tooth, the bonded material is then sculpted to fit your tooth and finely polished. 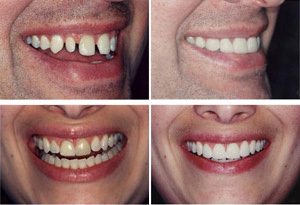 The resin fro cosmetic dentistry veneers comes in many shades so that we can match it to your natural teeth. Due to the layers involved, this procedure will take slightly longer than traditional silver fillings because multiple layers of the bonding material are applied. Typically bonding takes an hour to two hours depending on your particular case.